Founded from an 1868 bequest from Edwin Augustus Stevens, enrollment at Stevens includes more than 5,000 undergraduate and graduate students representing 47 states and 60 countries throughout Asia, Europe and Latin America. The university is home to three national Centers of Excellence as designated by the U.S. Departments of Defense and Homeland Security. Two members of the Stevens community, as alumni or faculty, have been awarded the Nobel Prize: Frederick Reines (class of 1939), in Physics, and Irving Langmuir (Chemistry faculty 1906-1909), in chemistry. 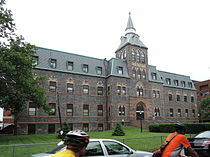 Stevens Institute of Technology is named after a family of accomplished inventors and engineers who also oversaw the development of Hoboken from an old farm into a thriving city. In 1784, the land now occupied by Stevens Institute of Technology was purchased by John Stevens, who would later reverse engineer the British steam locomotive to American standards for domestic manufacture. This innovation would be employed by ferries to Manhattan which still run from Hoboken's piers. Robert Stevens, one of John's sons, invented the flanged T rail, a form of railroad rail in prevalent use today including from the Lackawanna Terminal of Hoboken whose docks are also in a style designed by Robert. Along with his brother Edwin A. Stevens, Robert created America's first commercial railroad presently operating as a large portion of Amtrak's Northeast Corridor. Edwin died in 1868. In his will, he left a bequest for the establishment of an "institution of learning," providing his trustees with land and funds. Edwin's will was executed by surviving wife Martha Stevens who would also serve as a lifetime Trustee of the Institute. Martha Stevens oversaw much of the family's philanthropy toward the City of Hoboken including founding of the Church of the Holy Innocents as a free Episcopal church, a foundling hospital and birthing center at St Mary's Hospital; the Robert L. Stevens Fund for Municipal Research; manual training schools for both boys and young girls in Hoboken; the Hoboken Public Library and Manual Training School. What are the academic rankings for Stevens Institute of Technology? 1. number 99 for Academics. 2. number 43 for ROI (Return on Investment). 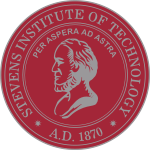 What universities are similar to Stevens Institute of Technology?